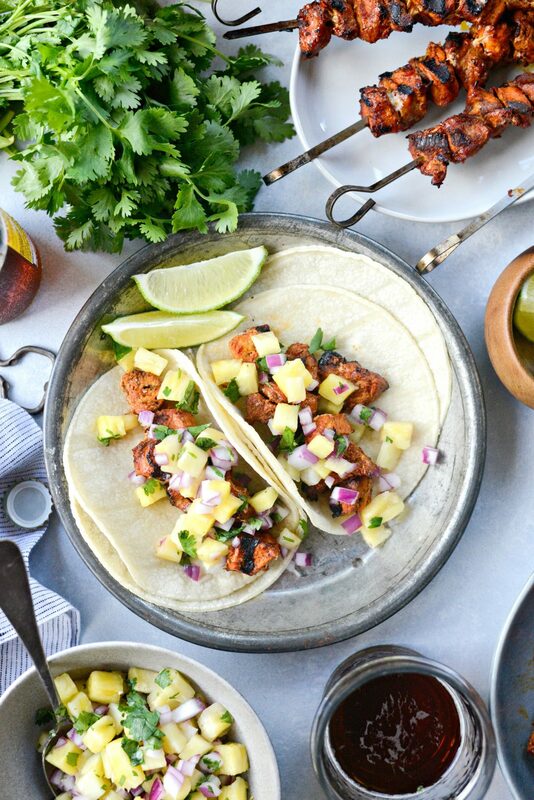 Tacos al Pastor is a dish brought by Lebanese immigrants and developed in Central Mexico. 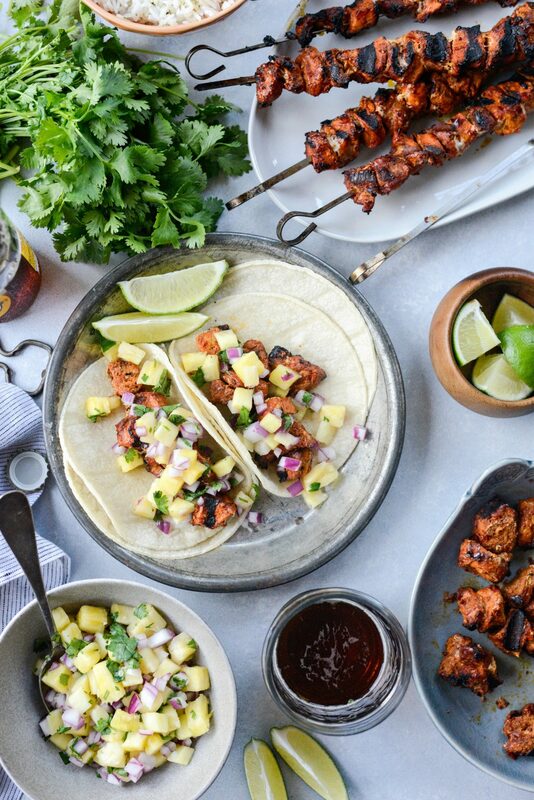 Based on shawarma, pork marinated in chiles, spices and pineapple is grilled (traditionally on a spit) and shaved off into tacos. In my easy version (because I don’t own a vertical spit) I marinated pieces of pork loin and thread them onto skewers and grill them on my outdoor grill. 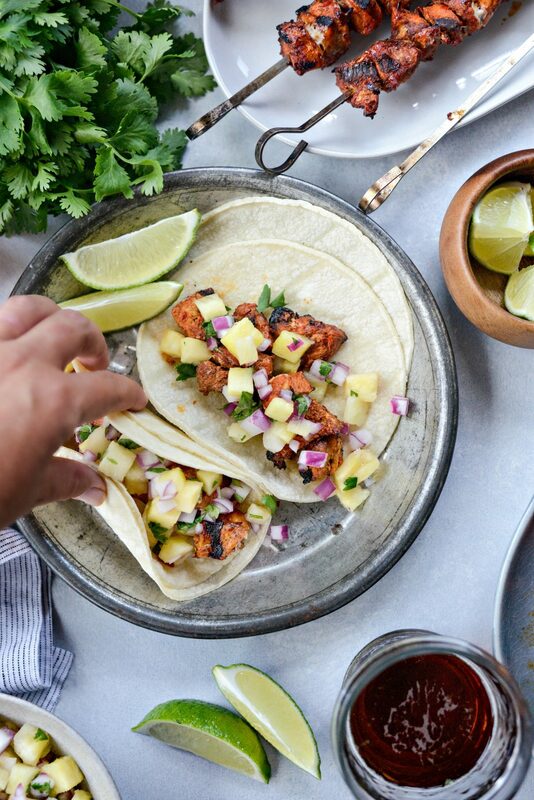 I serve these tacos with a easy pineapple salsa and fresh lime wedges. Tacos al Pastor has been my obsession since the first time I tasted them this summer. I met my good fried Heidi for lunch at Honchos, a somewhat new restaurant in downtown Clarkston. I was so excited to eat here because I’ve heard so many good things about it. We sat outside, at chips and salsa and chatted for hours. Typically when I go to a Mexican restaurant I go for steak fajitas or fish tacos. But their tacos al pastor called to me, I think it was the fresh pineapple salsa. 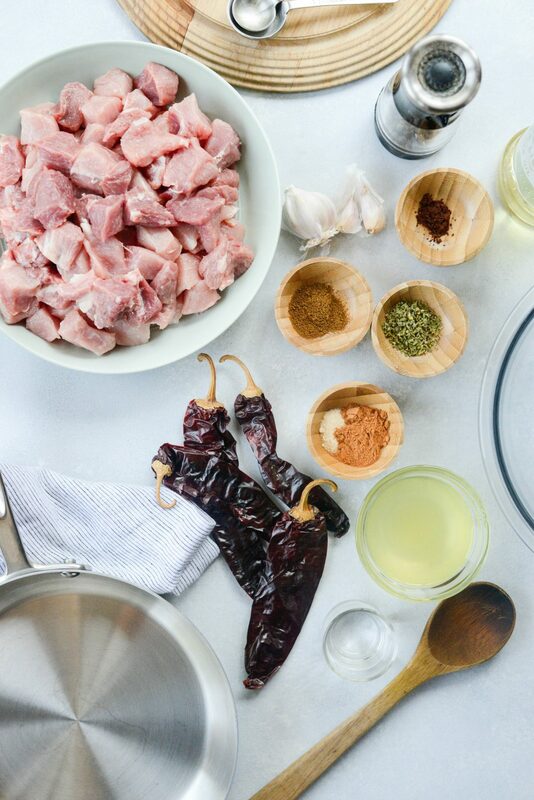 With having this passion for tacos al pastor, I made sure that I did lots of research and read all about how tacos al pastor came to be and came up with what I think is a simplified semi-authentic recipe. 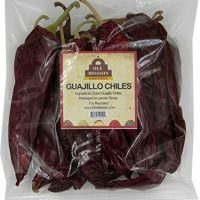 I even ordered guajillo chiles online. I was committed. Needless to say it was love after first bite. SO. much. flavor. 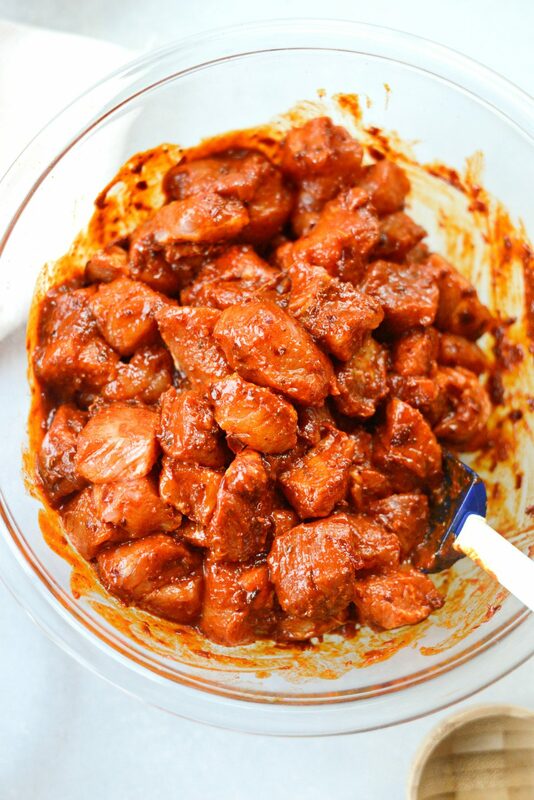 The pork marinates overnight in a blend of garlic, chiles, spices and pineapple juice. 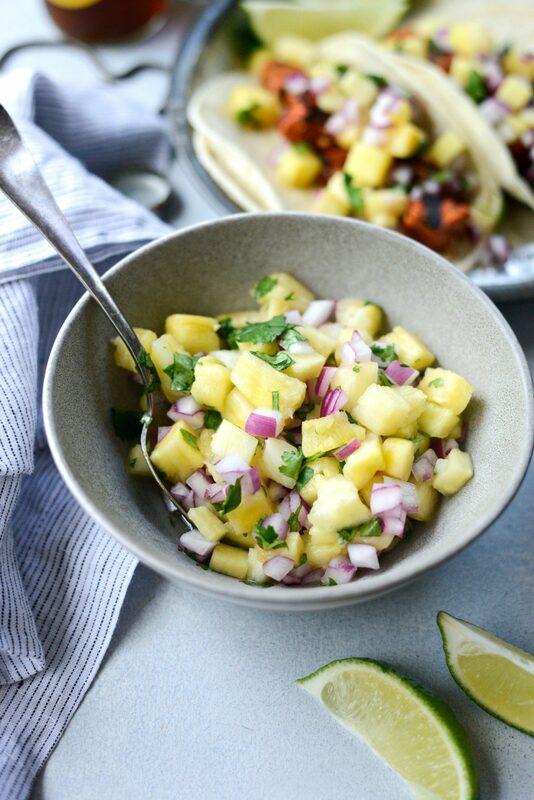 Skewered grilled and then stuff into tacos and topped with a simple yet MAJORLY fresh and delicious pineapple salsa. 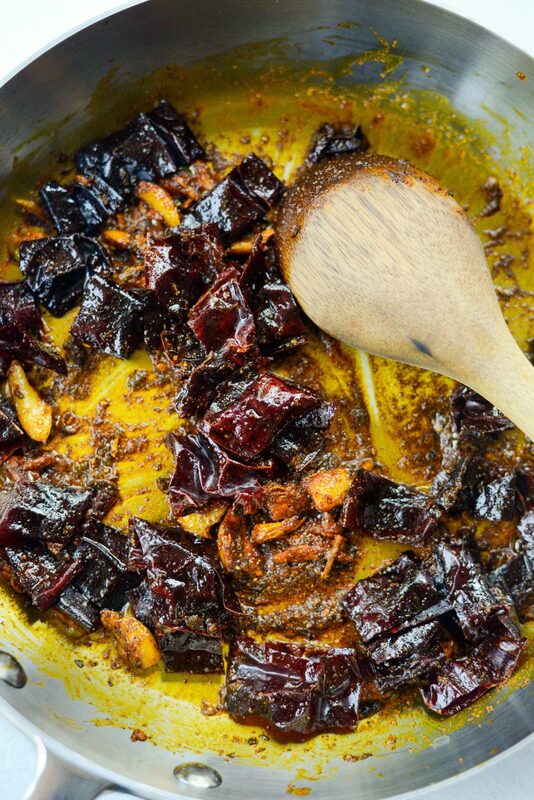 The most hands-on part of this recipe is making the marinade. 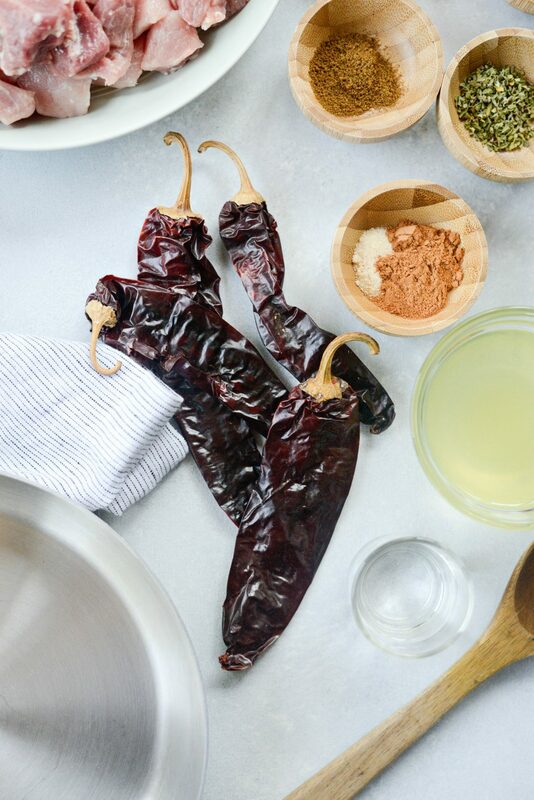 For this you will need: 1 tablespoon olive oil (plus more for greasing grill grates), 4 garlic cloves, smashed and peeled, 1 teaspoon annatto, 1 teaspoon Mexican oregano, 1/2 teaspoon ground cumin, 1/2 teaspoon freshly ground black pepper, 4 guajillo chiles, 1/2 cup pineapple juice, 3 tablespoons white vinegar, 3 to 4 pounds pork loins. 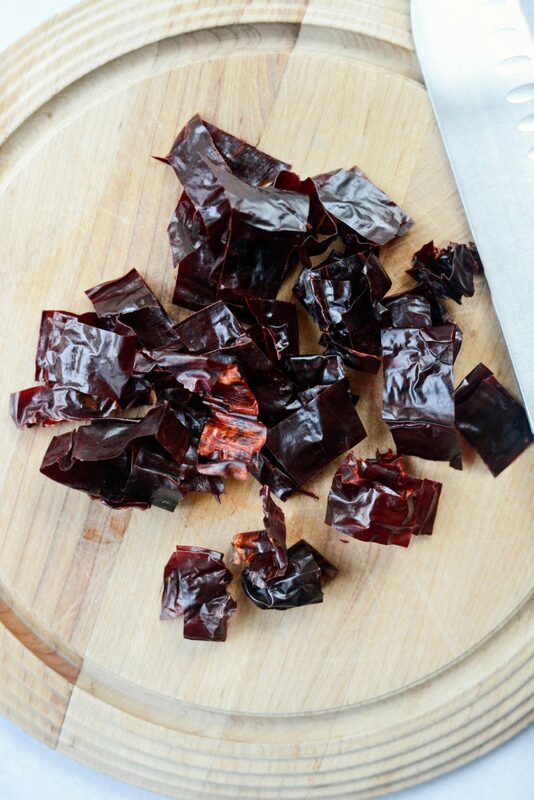 If you’re lucky, you can find guajillo chiles in your local market. 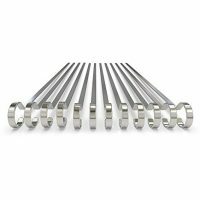 I looked everywhere I could think of and ended up buying them on amazon [affiliate]. 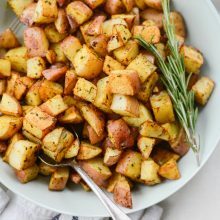 To start, add 1 tablespoon olive oil, the 4 garlic smashed garlic cloves, 1 teaspoon annatto, 1 teaspoon Mexican oregano, 1/2 teaspoon ground cumin, 1/2 teaspoon freshly ground black pepper. 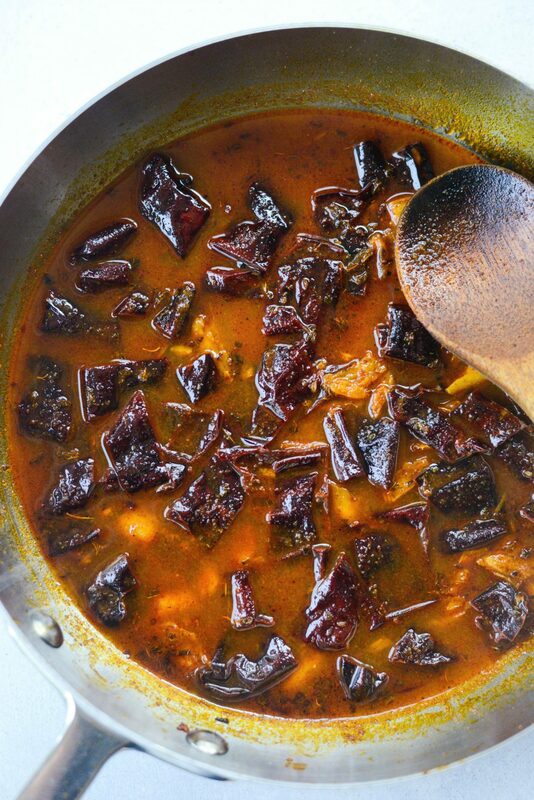 Heat on medium-low heat, stir and cook until the garlic softens and the spices are fragrant. About 4 minutes. 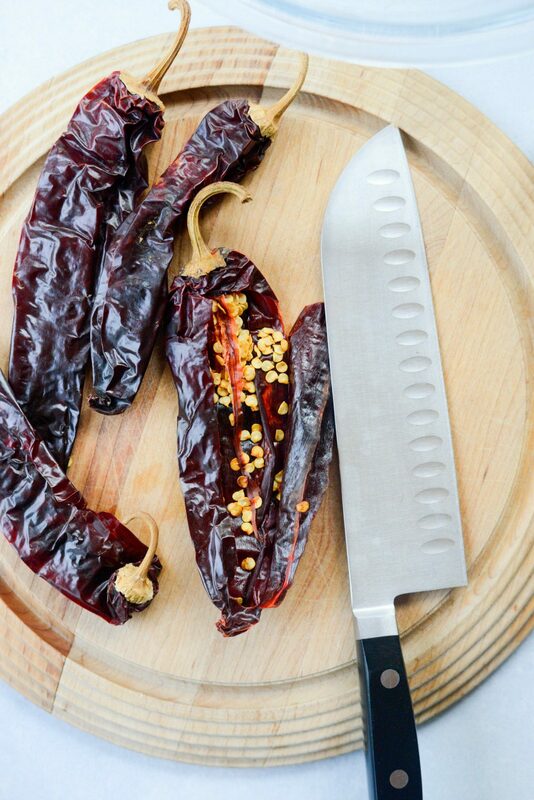 Meanwhile, cut the tops off of the chiles and slice them open. 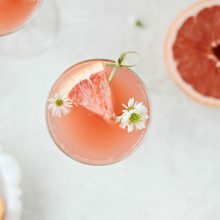 Remove the seeds and slice into strips. 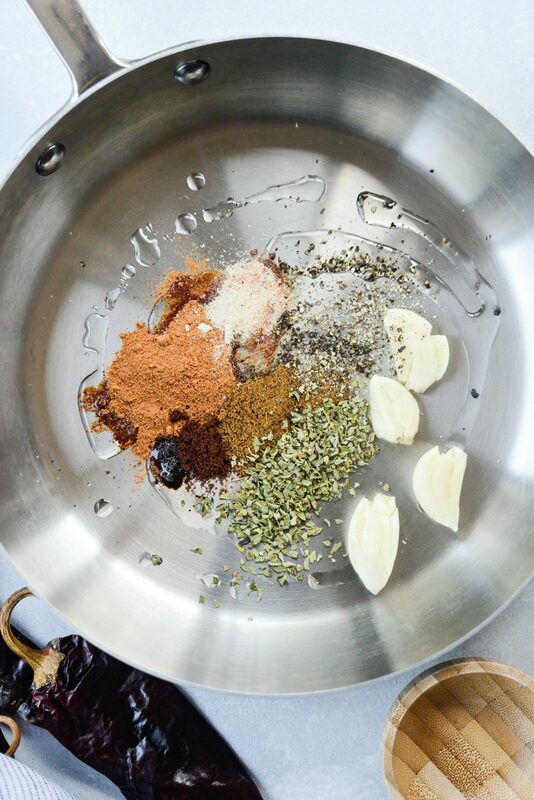 Once the garlic is soft, add in the chiles and sauté until they start to soften. Next, pour the pineapple juice and vinegar and simmer for a minute or so until the chiles soften even more. Allow this to cool completely. This is a good time to cut up the 3 to 4 pounds of pork loin. My grocery store sells a package of different cuts of pork loin. Most of which were bone-in, I just used my knife to cut around the bone and then diced the pork into bite-size pieces. 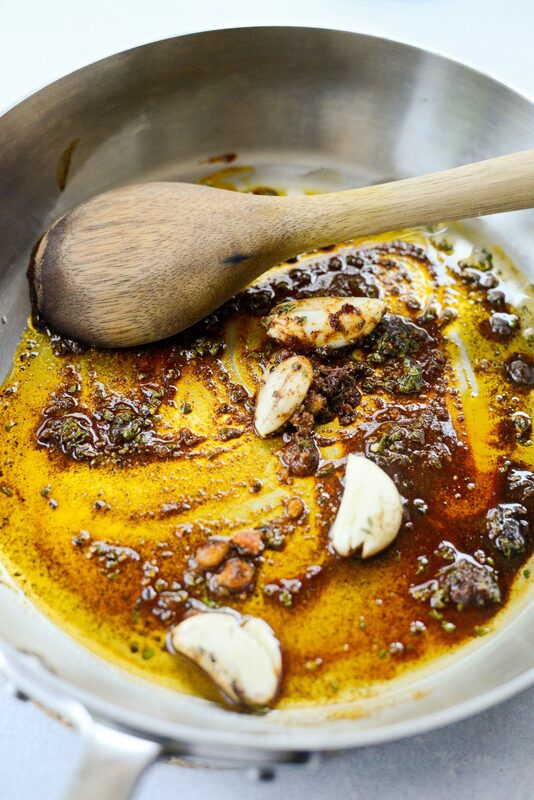 Once the marinade has cooled, carefully add it to your mini (or regular) food processor and puree until smooth. A cool trick I just recently learned from a couple of food blogger friends, is to save yourself from washing the lid of your food processor – which let’s face it, is not fun – place a piece of cling wrap over the top of the bowl before securing the lid. The liquids in the processor will stay contained in the bowl and your lid is saved! 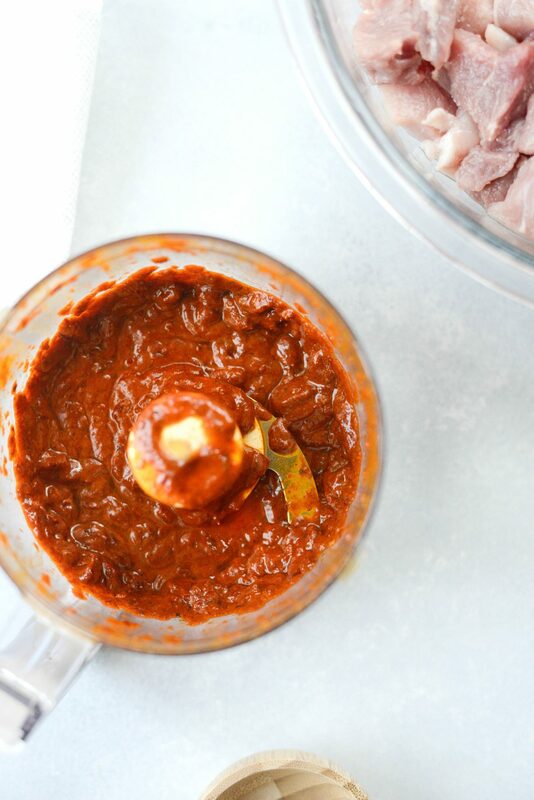 Pour that gloriously red-orange marinade over the pork (hence why you need it to cool, you don’t want to start cooking the pork with hot marinade). Toss to combine using a spatula that won’t stain because, that color is just asking to get on your white shirt or spatula. 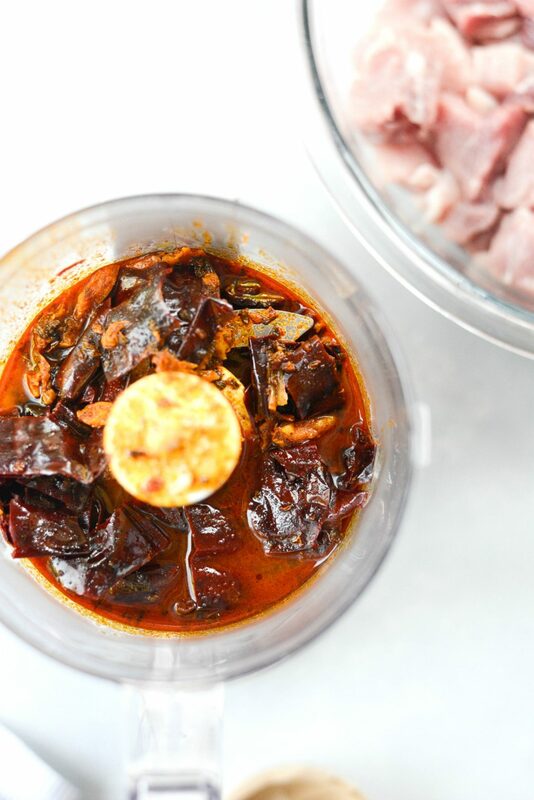 All that is left to do is cover this bowl with a lid and let it marinate over night in your fridge! 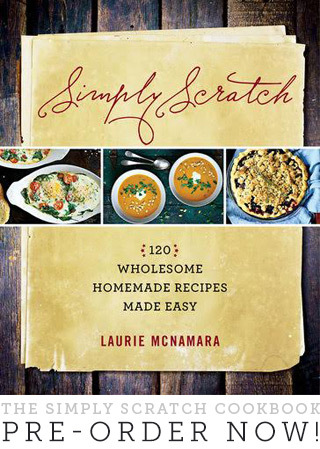 You guys, THIS is the bulk of the recipe and it’s pretty easy, no? Now its 12 to 24 hours later and it’s time to EAT. If I were you, I would slip a pair of (clean and never been used) protective gloves to protect your hands from the marinade staining them. I did not wear gloves, hence how I know this, because I totally forgot to grab a cheap pair at the store. It washed off pretty easily, but my cuticles and nails were a smidgen orange. Before grilling season all sides of the pork with kosher salt. 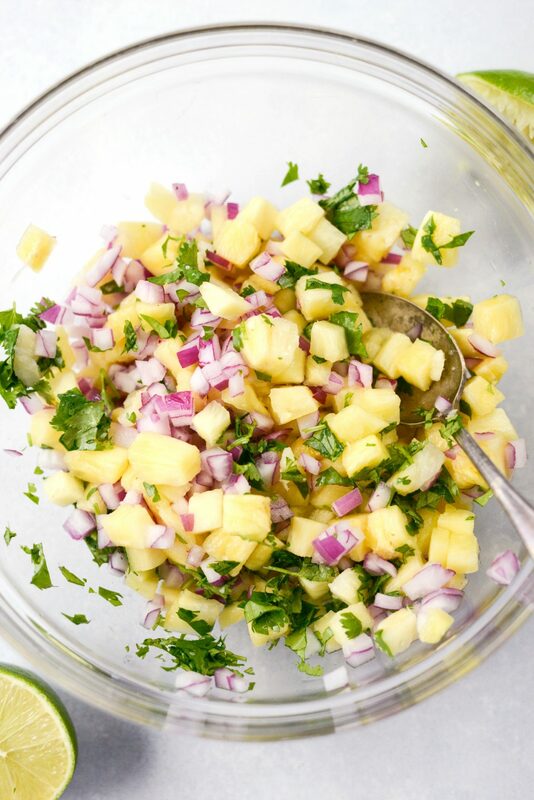 For the salsa, simply combine 1 pound of fresh, diced pineapple with 1/2 a medium red onion (finely diced), a handful of fresh cilantro – coarsely chopped, a couple pinches of kosher salt and the juice of 1/2 a lime. Stir and you’re ready to serve. 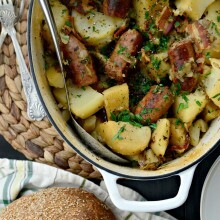 The porks crispy flavorful exterior is the bessssst. Use tongs to pull the meat off of the skewers and place into warm corn tortillas. 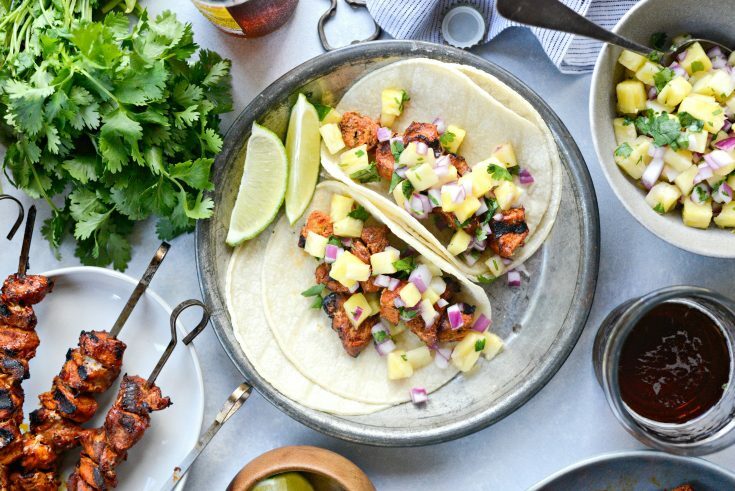 Tacos al pastor doesn’t need fancy toppings, sauces or cheese. Yes, I just typed that. 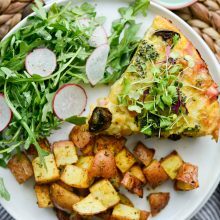 Simply top with the fresh pineapple salsa and a little extra lime. In my book, corn shells are a must. No questions asked. 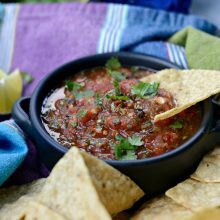 The corn flavor works so well with the spice crusted pork and salsa. This is a taco you’ll wish your jaw could unhinge so you could just inhale. Enjoy! 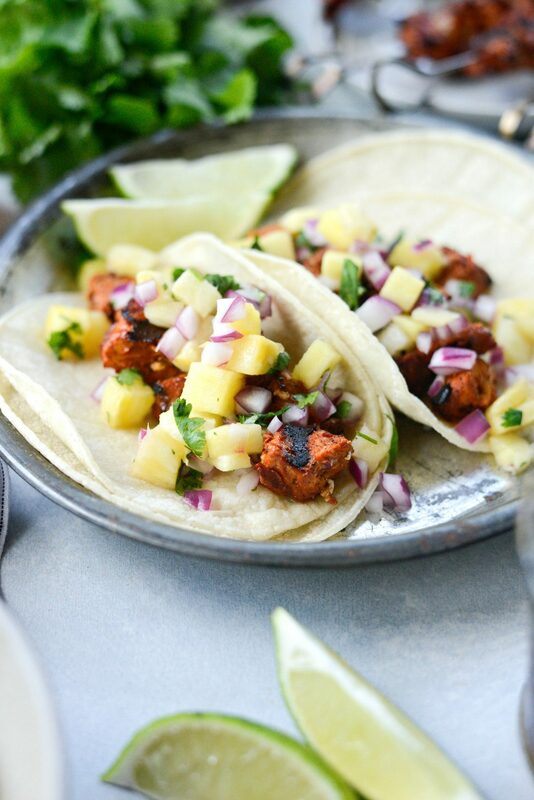 And if you give this Tacos al Pastor recipe a try, let me know! Snap a photo and tag me on twitter or instagram! Tacos al Pastor is a dish brought by Lebanese immigrants and developed in Central Mexico. 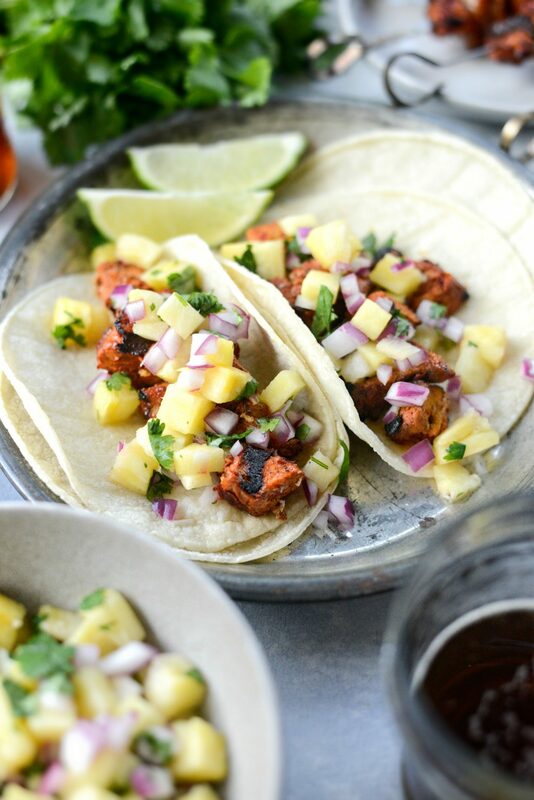 Based on shawarma, pork marinated in chiles, spices and pineapple is grilled (traditionally on a spit) and shaved off into tacos. 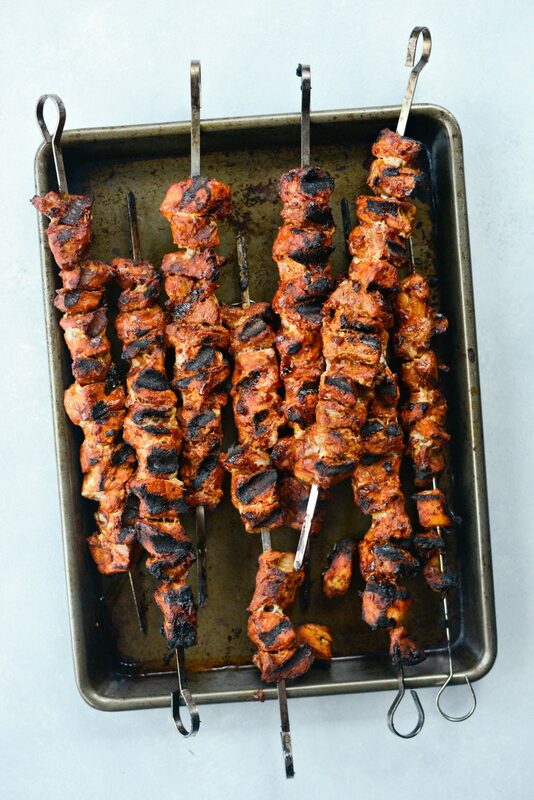 In my easy version (because I don't own a vertical spit) I marinated pieces of pork loin and thread them onto skewers and grill them on my outdoor grill. 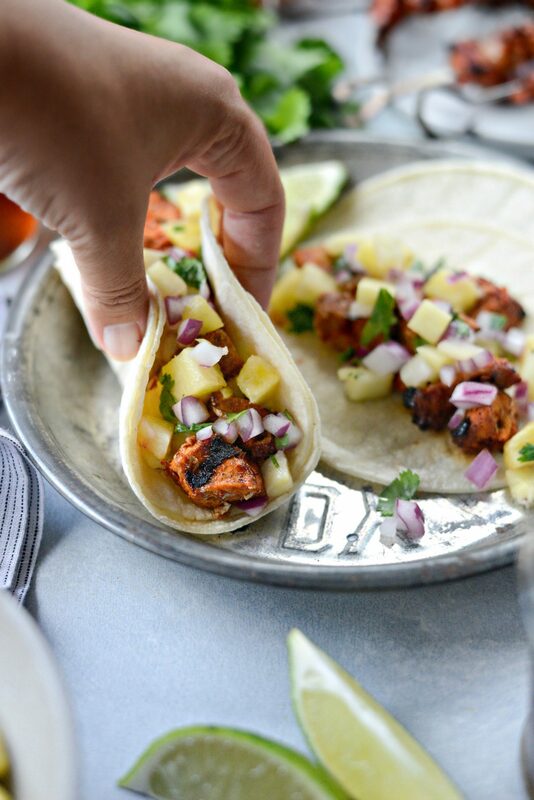 I serve these tacos with a easy pineapple salsa and fresh lime wedges. Add the oil, garlic, annatto, oregano, cumin and black pepper. Stir and heat on medium heat until the garlic softens and the spices are fragrant. 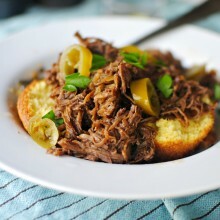 Add in the sliced chiles and stir for about a minute or until softened. Pour in the pineapple juice and vinegar and simmer for about a minute longer. Let cool before adding to a food processor and processing until smooth. 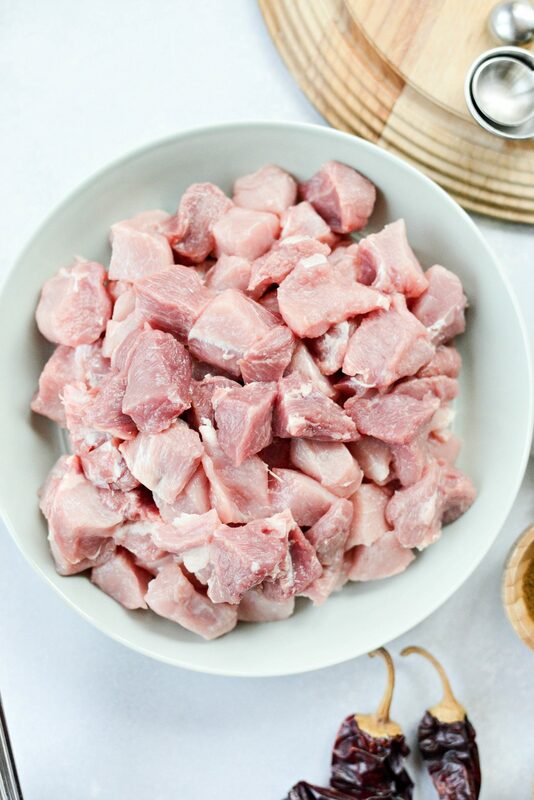 Dice the pork loin into 1/2 to 3/4 inch cubes and add it to a bowl.Pour the marinade over the pork and toss until combined. 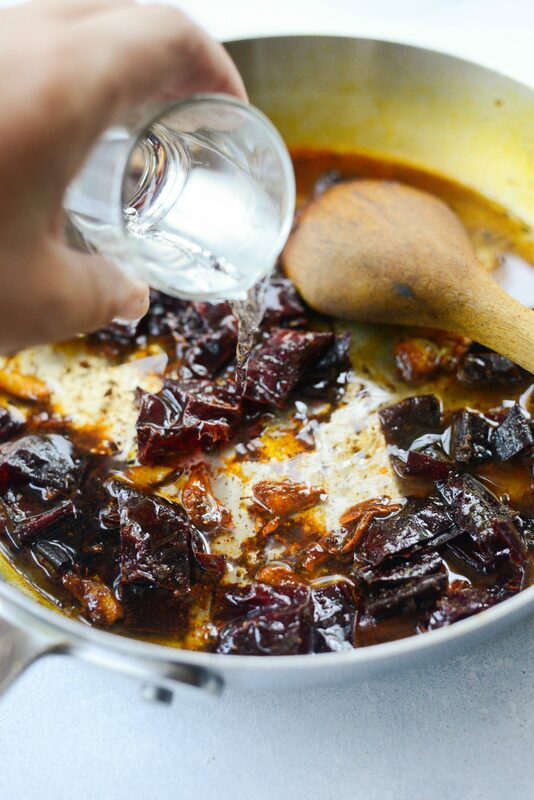 Cover and slip the bowl into your fridge to marinate over night. 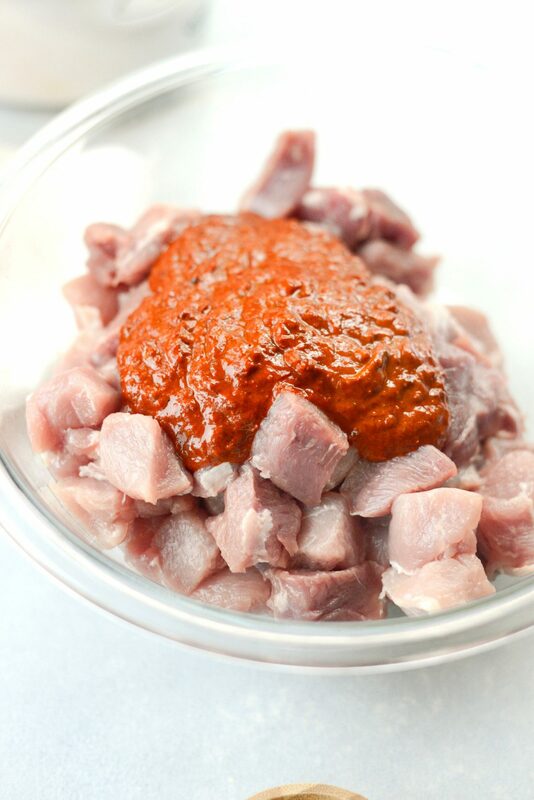 Slide the marinated pork onto skewers and season all sides of the pork with kosher salt. Keep them on the counter to take the chill off while you preheat your grill to 425º. 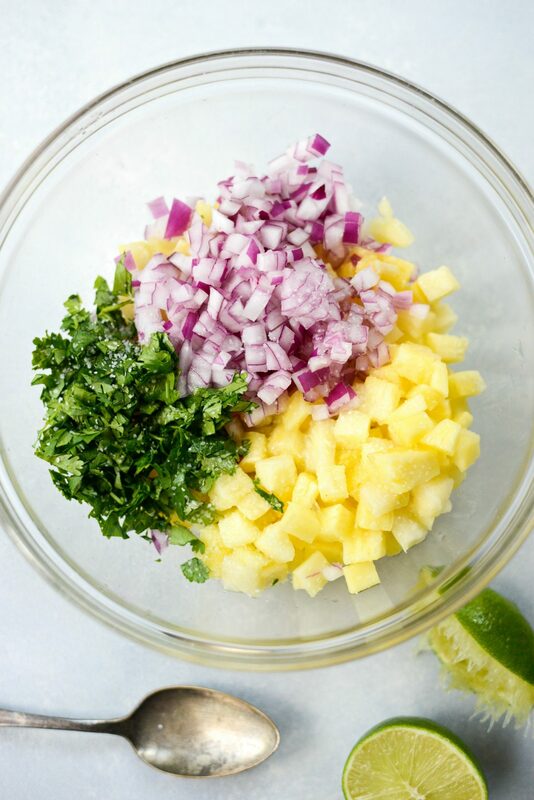 Quickly mix the pineapple, onion, cilantro, lime juice and salt. 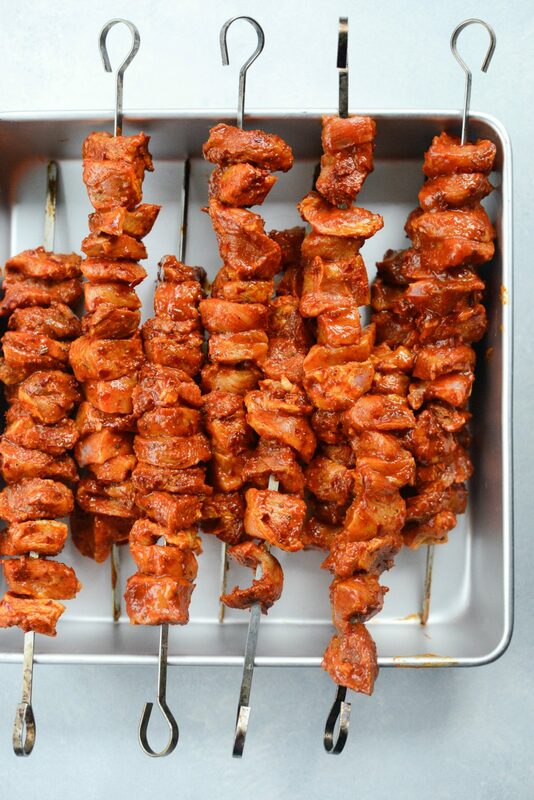 Grill the pork skewers for 3 to 4 minutes a side or until good grill marks form and the pork is fully cooked. Stuff warm corn taco shells with the grilled pork and top with pineapple salsa and a wedge of lime.